We have brought our huge assortment of Transformer Stud Nut which is highly durable and is prepared in compliance with the industrial standards. Understanding the requirements of our clients our products are prepared therefore they are highly preferred in the market. We let our whole range of products to go through a stringent quality test in which the flawlessness of our products is ensured. 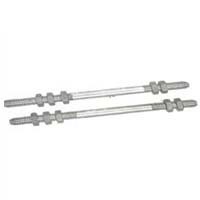 In cost effective prices our huge range of Transformer Stud Nut is available. Enriched with in-depth industrial knowledge as well as keen market understanding, we, Aarushi Exports, are a name to reckon with quality and integrity. We commenced our operations with a vision to earn good reputation in the domestic and international market segments. Ever since our inception, we have concentrated all our endeavors to provide our customers with impeccable quality products and services. Over the years, we have emerged as one of the renowned manufacturers, exporters of the industry. We are engaged in fabricating a qualitative range of Brass Precision Components, Brass Electrical Components, Brass Fasteners, Aluminium Components, and more. All our products are manufactured in strict compliance with the superior industrial as well as global standards. In order to fulfill the clients' desired requirement on time, we have developed a well integrated manufacturing facility. The unit is equipped with sophisticated machinery and equipment that facilitate smooth production processes. Besides, we are supported by a dexterous team of professionals who carry out all the processes/activities in accordance with the industry recommended guidelines. They work in coordination in order to attain maximum client satisfaction.